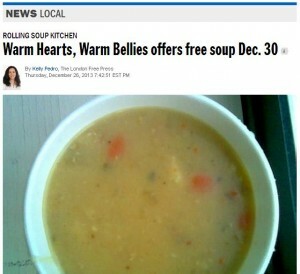 It’s a beautiful gesture, warm soup in the cold, lonely days between Christmas and New Year’s. This article in the London Free Press details the kind, charitable outreach of Craig Abel and Sandy Faugh, serving soup to those experiencing homelessness, in collaboration with Mission Services of London. A quick search on Google shows that this is no solitary event for Abel and Faugh, but that their charity and kindness extend to various programs and agencies throughout the community. We read this story, feel glad that there are good people in our community, and simply wish there were more like them. What does this meal of soup mean in the context of those experiencing homelessness, struggling to make ends meet on $626 per month of social assistance? It means a lot. It means a lot because with $626 per month, and average market rent for a bachelor apartment in London being $575, getting out of shelter into housing leaves one with simply not enough money to eat. Therefore, the food bank, soup kitchens, church meal programs, and these free bowls of soup become a necessary part of the struggle for survival, the struggle that involves walking around all day, each day, from agency to agency, program to program, just to meet the basic necessities. But what does this change? It doesn’t change tomorrow, and the fact that the hunger will return and there will be no more money until the end of the month. It doesn’t change that hunger in Canada is a poverty issue. It doesn’t change one’s ‘food insecure’ status. It does change one thing though: it makes it a tiny bit easier for governments to shirk their responsibility for citizens most in need, knowing that the charitable impulse will kick in, just enough to keep people alive. Governments have begun to outlaw soup trucks, for very different reasons, with very different outcomes. In places like Florida, soup trucks have been outlawed and public feeding of people experiencing homelessness outlawed, because these are seen as increasing vagrancy and decreasing safety in core neighbourhoods. This is foolishness, criminalizing poverty. In the UK, soup trucks outside are also being outlawed, but for a good reason. In response to the Olympics (ok, not the purest of motivations), London established 24/7 drop-in centres throughout the community where food and shelter from the elements are always available. With these services in place, they began to ban outdoor soup trucks where people were forced to line up in the rain and sleet, and instead encourage the organizations delivering these services to just partner with the drop-in centres, where people could access the food in a safe, comfortable, and well-staffed environment that also provided people with access to other supports. Is it possible that the best of motivations may not necessarily lead to the best outcomes? Does a band-aid put on and left too long actually cause a wound to fester? In the next post I will talk about homelessness, and one step forward with three steps back. I believe access to food should be as much of a human right for low income people living in the community as it is for people living in jails, emergency shelters and mental institutions. The number one reason people are in emergency shelters is the access to food three times a day seven days a week. I think government should be 100 percent responsible for people’s food security and they are if a person is in a government funded facility but their responsibility should also be extended to include those living in the community as well. I’m not sure why these people serving soup would do so in the parking lot of an emergency shelter when the majority of people there have access to food already.